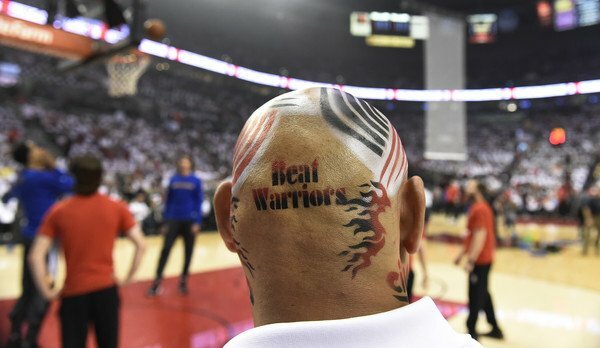 I think the Blazers won because of this guy. It was a rough night for the W’s in Portland last night; they were off their game and the opposition Portland Trail Blazers were en fuego, with Damian Lillard (40 pts) being his dangerous self. Also the Warriors game plan apparently called for not guarding small forward Al-Farouq Aminu, who hit his first 8 shots without a miss. The Dubs didn’t quit, with Draymond Green hitting five 3s in the 3rd quarter to single-handedly keep them in the game; but in the end they ran out of gas and took the L.
It’s funny, I’ve brought so many people onto the bandwagon that whenever the Warriors lose a game, I am compelled to offer an explanation. In this case I feel like it’s pretty simple: The Blazers played great, the Warriors did not. The Blazers were in front of their home crowd, energized and inspired. The Warriors were not. It happens like that sometimes. Fortunately there’s another game tomorrow, and Steph Curry (remember him?) may or may not play in it. There’s not much more to say at this point. Keep calm and carry on.